Built in high density polyethylene (HDPE) with a high resistan- ce to vapours and corrosive liquids. 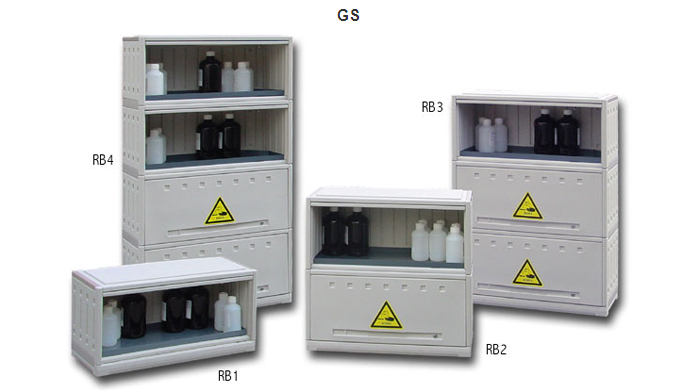 Equiped with shelves for acid and base separate storage (exept model RB1). Entirely built in light grey high density polyethylene (HDPE). “Acid” and “Base” warning labels. Removable retention tank in PVC (at each level; retention capa- city 6 l per tank). Front opening with retractable door. Door(s) with lock (for each level). 4 swivel castors for RB1 and RB2 models (60 mm of extra height). Opening vent Ø 100 mm (must be ordered with the cabinet).